Central Bank of Turkmenistan on the 10 Turkmenistan manat banknote. 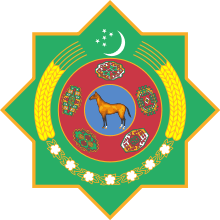 The Central Bank of Turkmenistan is the national bank of Turkmenistan. It is located in the centre of Ashgabat. It was established in 1991 and regulates the country’s banking system and supervises the national financial policy. It is located in a distinctive high rise building. The Board of the Central Bank of Turkmenistan consists of an odd number of people. This includes the Governor, who is the Chairman of the Board and several Vice-Chairmen. Merdan Annadurdiyev is the Governor since January 2015. In 2013, the Central Bank of Turkmenistan has issued a new collection of commemorative coins in honor of the Turkmen Horse Day. The gold and silver coins, called "Akhalteke horse of the Turkmen", have a value of $18. Ancient Akhal-Teke horses, known as "horses from heaven", are part of the national heritage of Turkmenistan, which is considered an international center of horse grooming. ↑ "The Central Bank of Turkmenistan implements SmartVista to strengthen its operations". BCP Group. April 9, 2009. Retrieved June 30, 2009. ↑ Barron, Lisa (21 October 2013). "New commemorative coins mark Turkmen Horse Day". Cistran Finance. Retrieved 25 October 2013.